Hmm... You know now that you mention it... I do have 3 groups of panels. Two groups face 110 degrees and the other group faces 200 degrees. There's one panel in the 110 group that produces way more than the rest. What you just suggested sounds like I have 3 panels arranged incorrectly in the manager. Is there anyway for the owner to take over complete ownership of the system from the installer so I can make the changes myself to the layout? Thanks so much for this. I think you hit the nail on the head. Last edited by gene1138; 11-08-2018, 07:38 PM. Not sure, I self-installed so I have full access. The "array builder" is in the configuration section (gear) of enlighten manager. Must use a browser that still supports flash to use it. You're welcome - I can't miss them all. Hi everyone - thanks in advance for any insight anyone can offer. This issue has me baffled. My system has been working fine for over two and half years. Three days ago the system-wide Enphase production graph start showing some very weird behavior. Instead of the smooth power production curve I'm normally used to seeing on sunny days, I start seeing a "step ladder" effect. i.e. 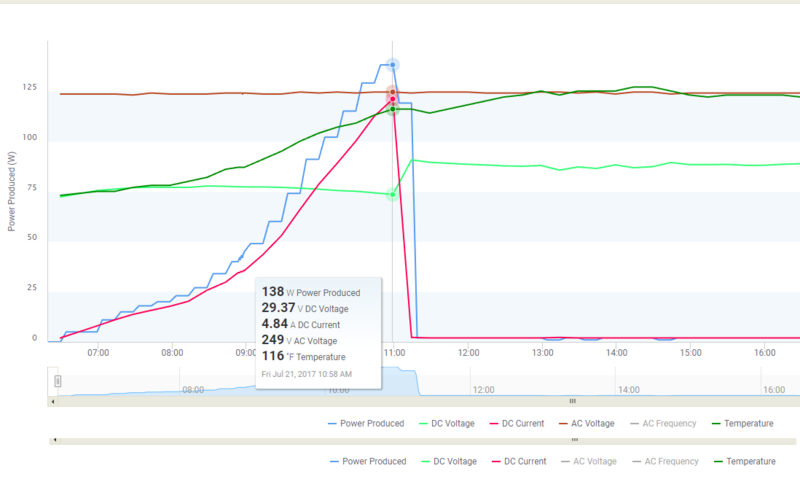 AC current going up, then down slightly, then up again as the day progresses. Coincidentally (or not), around the same time one of my panels starts going offline around 11 AM and stays dark for the remainder of the day. The next day (and every day since) the panel starts producing normally (except for the aforementioned step ladder issue), then again goes offline around the same time. Broken panel or inverter? I'm highlighting the moment production goes to zero for this one panel....usually around 11 AM each day. System-wide production. This is normally a smooth curve on sunny days. Instead, production goes up, then down slightly, then up again. All panels exhibit this behavior. Clearly something needs to be fixed, but I'd love to do as much troubleshooting from the comfort of my home office before I crawl up on my 120* roof (I'm in NC). Have you called the installer yet ? At <4 yrs. old and still under warranty, that would be my first call. Besides, fooling with it yourself may create warranty claim problems.